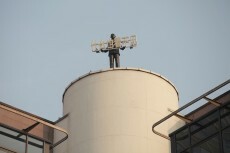 The Kempinski Hotel Beijing Lufthansa Center announces Beijing’s leading artist Wang Shugang’s figure sculptures exhibition at its East Garden. The exhibition will present the famous sculpture “meeting” and the especially for Kempinski designed art sculpture “nothing to see”. 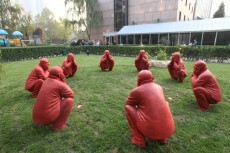 “Meeting”, a sculpture of eight red men crouching in a circle has been awarded as “the people's choice” at the Sculpture by the Sea exhibition 2012 in Cottesloe, Australia and enjoyed great popularity during its public exhibition 2009-2011 in Vancouver, Canada as well as during its first exhibition at the 8G summit meeting of world leaders in Heiligendamm, Germany in 2007 implying to convert the serious nature of meetings, as an influence on the way of thinking, the psyche and the consciousness of people into an exhilarating memorial. 2 sculptures are exhibited in the hotel public area for a period of three subsequent years from October 2012 until October 2015.